Attractive gym floor covering, without the wrinkles or ripples! Tape is not needed to secure our tiles. With a carpeted stop side, you can turn your multipurpose gymnasium into a pretty room fit for a banquet. Attractive gym floor covering, without the wrinkles or ripples! Since tape is not needed to secure our tiles, GymGuard floor cover tiles are easy to handle, easy to set up, and easy to break down. 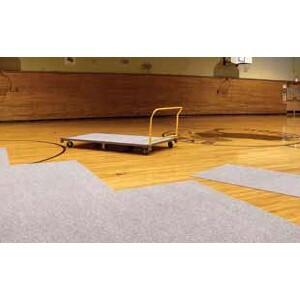 With a carpeted stop side, you can turn your multipurpose gymnasium into a pretty room fit for a banquet. Safe, lay flat and do not slide - No tape required!